Called COSMIC, for Coherent Scattering and Microscopy, this X-ray beamline at Berkeley Lab's Berkeley Lab's Advanced Light Source (ALS) allows scientists to probe working batteries and other active chemical reactions, and to reveal new details about magnetism and correlated electronic materials. COSMIC has two branches that focus on different types of X-ray experiments: one for X-ray imaging experiments and one for scattering experiments. In both cases, X-rays interact with a sample and are measured in a way that provides, structural, chemical, electronic, or magnetic information about samples. 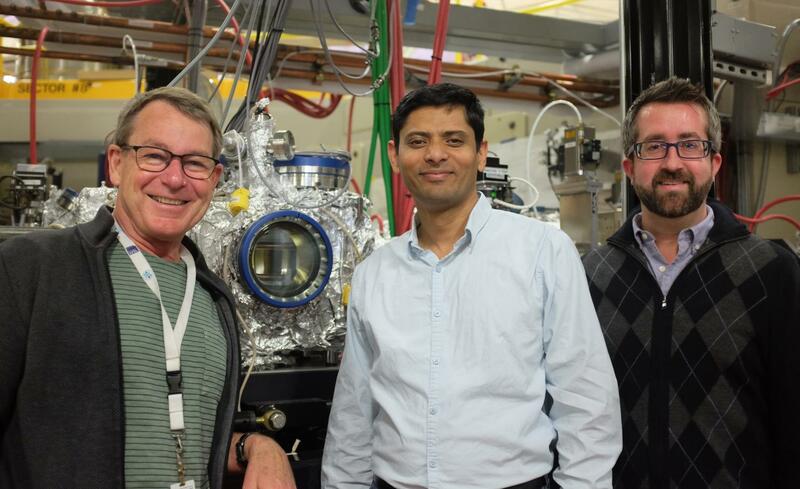 The beamline is also intended as an important technological bridge toward the planned ALS upgrade, dubbed ALS-U , that would maximize its capabilities. Now, after a first-year ramp-up during which staff tested and tuned its components, the scientific results from its earliest experiments are expected to get published in journals later this year. A study published earlier this month in the journal Nature Communications, based primarily on work at a related ALS beamline, successfully demonstrated a technique known as ptychographic computed tomography that mapped the location of reactions inside lithium-ion batteries in 3-D. That experiment tested the instrumentation that is now permanently installed at the COSMIC imaging facility. "This scientific result came out of the R&D effort leading up to COSMIC," said David Shapiro, a staff scientist in the Experimental Systems Group (ESG) at Berkeley Lab's ALS and the lead scientist for COSMIC's microscopy experiments. That result was made possible by ALS investments in R&D, and collaborations with the University of Illinois at Chicago and with Berkeley Lab's Center for Advanced Mathematics for Energy Research Applications (CAMERA), he noted. "We aim to provide an entirely new class of tools for the materials sciences, as well as for environmental and life sciences," Shapiro said. Ptychography achieves spatial resolution finer than the X-ray spot size by phase retrieval from coherent diffraction data, and "The ALS has done this with world-record spatial resolution in two and now three dimensions," he added. The ptychographic tomography technique that researchers used in this latest study allowed them to view the chemical states within individual nanoparticles. Young-Sang Yu, lead author of the study and an ESG scientist, said, "We looked at a piece of a battery cathode in 3-D with a resolution that was unprecedented for X-rays. This provides new insight into battery performance both at the single-particle level and across statistically significant portions of a battery cathode." Ptychographic tomography can be particularly useful for looking at cellular components as well as batteries or other chemically diverse materials in extreme detail. Shapiro said that the X-ray beam at COSMIC is focused to a spot about 50 nanometers (billionths of a meter) in diameter; however, ptychography can enhance the spatial resolution routinely by a factor of 10 or more. The current work was performed with a 120-nanometer beam that achieved a 3-D resolution of about 11 nanometers. COSMIC's X-ray beam is also brighter than the ALS beamline that was used to test its instrumentation, and it will become even brighter once ALS-U is complete. This brightness can translate to an even higher nanoscale resolution, and can also enable far more precision in time-dependent experiments. Making efficient use of this brightness requires fast detectors, which are developed by the ALS detector group. The current detector can operate at a data rate of up to 400 megabytes per second and can now generate a few terabytes of data per day – enough to store about 500 to 1,000 feature-length movies. Next-generation detectors, to be tested shortly, will produce data 100 times faster. "We are expecting to be the most data-intensive beamline at the ALS, and an important component of COSMIC is the development of advanced mathematics and computation able to quickly reconstruct information from the data as it is collected," Shapiro said. To develop these tools COSMIC coupled with CAMERA, which was created to bring state-of-the-art mathematics and computing to DOE scientific facilities. CAMERA Director James Sethian said, "Building real-time advanced algorithms and the high-performance ptychographic reconstruction code for COSMIC has been a highly successful multiyear effort between mathematicians, computer scientists, software engineers, software experts, and beamline scientists." The code the team developed to improve ptychographic imaging at COSMIC, dubbed SHARP, is now available to all light sources across the DOE complex. For COSMIC, the SHARP code runs on a dedicated graphics processing unit (GPU) cluster managed by Berkeley Lab's High Performance Computing Services. Besides ptychography, COSMIC is also equipped for experiments that use X-ray photon correlation spectroscopy, or XPCS, a technique that is useful for studying fluctuations in materials associated with exotic magnetic and electronic properties. COSMIC enables scientists to see such fluctuations occurring in milliseconds, or thousandths of a second, compared to time increments of multiple seconds or longer at predecessor beamlines. A new COSMIC endstation with applied magnetic field and cryogenic capabilities is now being built, with early testing set to begin this summer. Scientists have already used COSMIC's imaging capabilities to explore a range of nanomaterials, battery anode and cathode materials, cements, glasses, and magnetic thin films, Shapiro said. "We're still in the mode of learning and tuning, but the performance is fantastic so far," he said. He credited the ALS crew, led by ESG scientist Tony Warwick, for working quickly to bring COSMIC up to speed. "It's pretty remarkable to get to such high performance in such a short amount of time." The ALS is a DOE Office of Science User Facility. Development and deployment of the COSMIC beamline was supported by the DOE Office of Science.